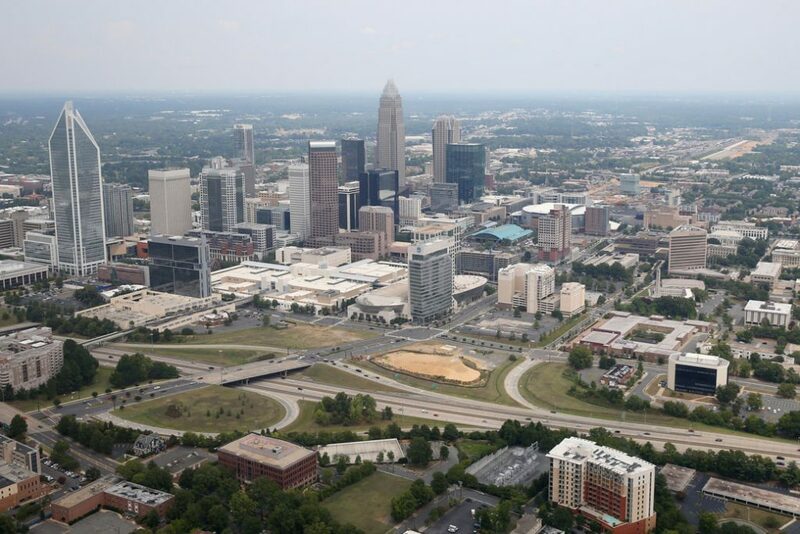 This issue brief uses the environmental impact statement (EIS) of the Charlotte Area Transit System (CATS) Blue Line light rail extension to demonstrate how NEPA strengthens infrastructure projects, as well as how federal environmental, civil rights, and historic preservation statutes guide the content of the review. The light rail line in Charlotte, North Carolina, also shows that meaningful enforcement of federal law requires federal agencies to review projects prior to construction given the threat of irreparable harm that major infrastructure facilities pose—harm that could not be sufficiently remedied through post-construction legal action. In addition to exploring the CATS project, the brief discusses the origins of NEPA and outlines the issue of permitting. Negative impacts can include anything from habitat loss and water pollution to the destruction of historic buildings and the disproportionate condemnation of homes and businesses in low-income communities or communities of color. Only a small percentage of infrastructure projects—those likely to produce significant impacts—must undergo a full review.7 In these cases, the lead federal agency must weigh and balance the benefits and drawbacks based on sound analysis. After public review of and comment on the draft EIS, the agency responsible for deciding on the project publishes a final EIS that responds to the public’s comments. Importantly, in the absence of environmental review, many negative impacts would become apparent only after the project sponsor completes construction, dramatically increasing the cost of remediation and resulting in certain irreversible harms. Moreover, eliminating review would close a vital pathway through which local residents are able to make their voices heard during the project planning and development process. Equally as important, NEPA serves as a framework that helps federal agencies coordinate review and enforcement of numerous federal environmental, civil rights, and historic preservation statutes. In other words, many federal laws apply to infrastructure projects, and NEPA helps bring order to the review and enforcement process. CEQ regulations require that federal agencies comply with other legal requirements concurrently with the NEPA process and that documentation—such as studies, surveys, and analyses that those other laws require—are integrated into the NEPA process. In fact, a draft EIS must list all federal permits, licenses, and other entitlements that must be obtained to implement the proposal.14 The value of this coordinating function cannot be overstated. After carefully reviewing the preliminary rail design in relation to the communities of concern, CATS found, “Portions of residential properties may be required for partial acquisition and/or easements; however, no residential uses would be displaced as a result of the Preferred Alternative.”23 In total, construction of the extension required CATS to acquire 90 acres of land, resulting in the displacement of 14 commercial or industrial businesses. A review of these businesses found that none provided “a unique or special service to a community of concern.”24 CATS conducted this same type of analysis for other impacts, including noise, vibration, safety, security, visual, and aesthetics. In total, the environmental review process allowed CATS to use its EIS to comply with all 13 applicable laws and executive orders, as well as with the relevant laws and procedures of the state of North Carolina. These laws and executive orders can be found in the sidebar. Beyond NEPA, project sponsors must also frequently secure federal permits before beginning construction. A federal permit is a written authorization to undertake a specific activity. For example, in addition to complying with NEPA, CATS was required to obtain a Clean Water Act Section 404 permit from the Army Corps of Engineers. The permit authorized CATS to discharge fill materials into U.S. waters. This raises a basic question: If environmental review is intended to discover project impacts, why must a state or local government sponsor also obtain a separate permit for a certain subset of impacts? Review and permitting are separate for two reasons. First, the environmental review and permitting requirements stem from different federal statutes. NEPA requires environmental review, while the Clean Water Act mandates that project sponsors must secure a permit for activities that affect U.S. waters. Second, and more importantly, permit applications typically require more detailed analysis than would otherwise come from an EIS. In other words, the dual requirement reflects the fact that certain impacts are more complex than others and therefore necessitate additional analysis prior to federal approval. The analyses conducted for the permit application can be folded into an EIS, presented as an appendix to an EIS, or incorporated by reference to avoid duplication. The scope and content of each EIS differs depending on the project in question. The CATS Blue Line EIS contains 22 chapters that respond to 13 federal laws and executive orders.36 Table 1 in the PDF details each chapter, including the applicable federal laws and executive orders, as well as selected findings. Some federal laws are fully covered by a single chapter. For example, Chapter 8 covers cultural resources, including buildings, structures, sites and objects that are included or eligible for inclusion on the National Register of Historic Places. Other federal laws, such as the Civil Rights Act of 1964, are crosscutting, as any negative project impact could have discriminatory effects depending on its relation to federally protected classes of persons. The crosscutting laws are not listed for every chapter but are listed instead for the most relevant chapters. The table does not include state laws and regulations. Each chapter in the CATS EIS is the fulfillment of the public’s collective political will. Over many years, the public has again and again affirmed that federal policies, programs, and spending should not be used to discriminate, degrade the environment, or harm endangered species—to name only a few federal protections. NEPA translates this desire into a concrete process for ensuring that infrastructure facilities adhere to these protections while also generating economic, social, and environmental value. In the end, the Blue Line extension will exist essentially in perpetuity. Taking the time necessary to study its potential impacts was a small price to pay to allow for informed decision-making and fulfill the protections codified within federal law. The environmental review process improves governance, increases transparency, and makes infrastructure projects better by reducing environmental and community impacts through public participation and mitigations. Moreover, NEPA provides a uniform process by which substantive federal environmental, civil rights, and historic preservation statues can be enforced effectively. Scaling back or eliminating NEPA would undermine the protections enshrined in federal law as a result of decades of Americans expressing their collective political will.